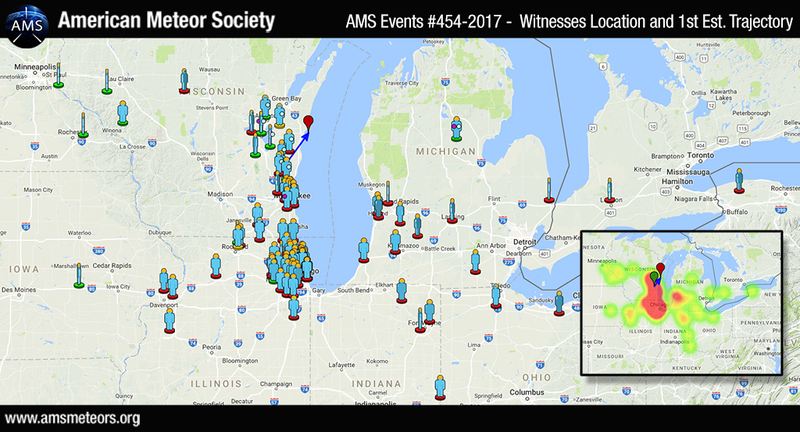 The AMS has received 467 reports so far (and counting…) about of a fireball event over seen over Wisconsin on Monday, February 6th 2017 around 01:27 CST (07:27 UT.). 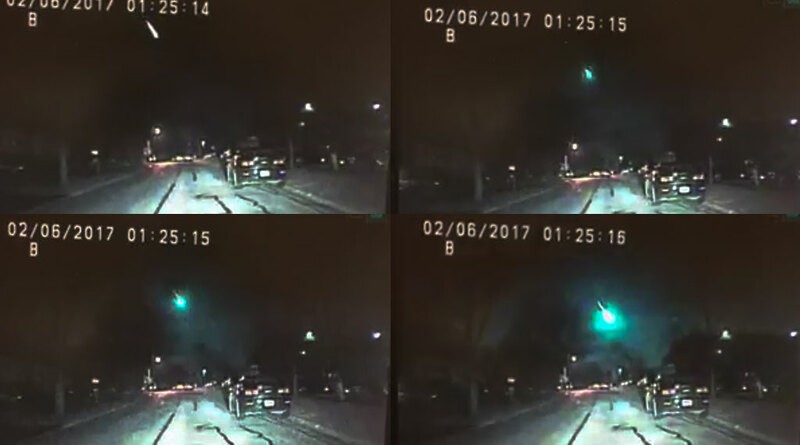 The green fireball was seen primarily from Illinois and Wisconsin but witnesses from Michigan, Indiana, Ohio, Iowa, New York, Kentucky, Minnesota and Ontario (Canada) also reported the event. If you witnessed this event please fill an official fireball report.If you have a video or a photo of this event please contact us. The map below shows the witnesses location with the first estimated trajectory. The preliminary estimated trajectory plotted from the witness reports shows the meteor was traveling from the Southwest to Northeast ended its flight on the Lake Michigan somewhere between Sheboygan and Manitowoc, Wisconsin. NASA Astrobiologist Marc Fries found evidence of the meteorite fall on NOAA’s NEXRAD Doppler Weather Radar. Heard impact of fireball in Neenah Wisconsin. Do not know where it landed, would go to landing sight if i knew where? Do you have any idea on your end? 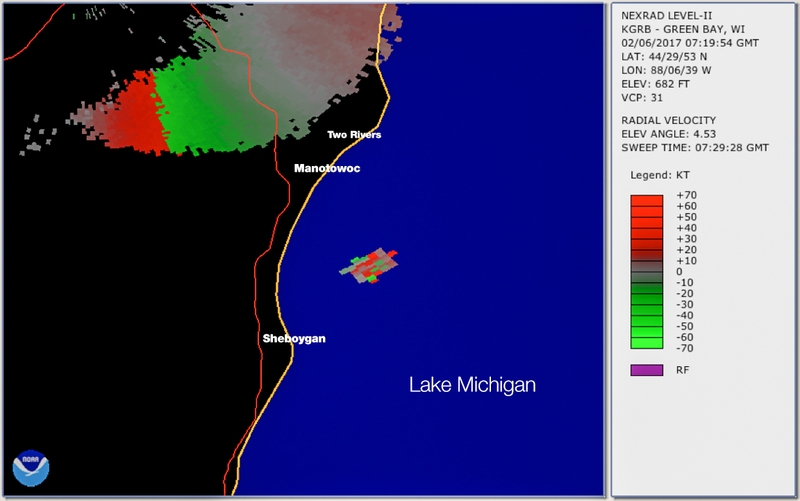 You will see that this object ended up in Lake Michigan. I did not see the Feb. 6, 2017 fireball (I was inside), but I did hear what sounded like a large explosion & rumble & felt the floors shaking. I am in Plymouth, WI (Sheboygan county) 53073. I live in mid Michigan. Between 10:30 – 11:00 last night I was talking to a friend on our home phone which is a landline phone. During the conversation, I experienced something really strange. The house was quiet, and during the conversation I felt/heard something like a puff of air that seemed to come out of the phone and hit my ear. I don’t remember an actual sound, it was more like a sort of vibration or something you would experience if there was a sonic boom or large clap of thunder. It only lasted a second and there was no repeat of what happened. I described to my friend what happened and asked if she had felt it, but she had not. I got up to see if there was any lightning in the sky, but the sky was clear and it was too cold for thunderstorms. I did turn off the TV and computer, just in case. If there had been any activity going on in the house, I probably would not have noticed the experience. Driving on hwy 212 in Minnesota at 1:26 in the mourning saw a bright blueish green streek of light rocketing through the sky. I have to say it was pretty amazing to witness. I live in Ottawa, Illinois, 41.3456° N, 88.8426° W.
My father and I were driving northbound on 94/41 just passing the Illinois/ Wisconsin border in Racine county and saw a slow, green shooting star/ fireball type object! It was too slow to be a shooting star, lasted a good 5 seconds or so. Seemed to be traveling west to east or possibly SW to NE. Time was approximately 9:40-9:45 PM We both saw it and said what is THAT!? First time seeing such a thing! I saw another one last night Feb 8: I was coming on 36 East towards Stillwater at about 9:35 pm. I saw it very clear and similar to the one in your film. St. Croix River, south east of 36. I was driving and could not film it , sorry! In the wee hours of November 11th into November 12th, 2009, I saw a huge green fireball as I was driving west on Butterfield Rd. toward i-355 (just east of it near Oakbrook. It was traveling low, in a south eastern direction. It was at least as big as the one in this video, if not bigger. I could see the thick black/grey textures of the dark smoke trail as it passed behind one of the tall office buildings. I couldn’t believe how much detail I could see in the smoke trail, and how low and close it was. I’ve seen smaller fireballs before, even green, but never with a thick smoke trail like that. I was just starting my drive out of state for the night. I actually passed 355 coming from the west by mistake, and had to turn around, and that’s the only reason I ended up seeing it. I couldn’t believe that I found no evidence of anyone else seeing it that night. It was around 12:45 – 1:15 AM on a Tuesday or Wednesday night. plunged into Lake Michigan, Aquarius Project, and teens across the city are now working together to design, build, and test a submersible sled (with magnets) that can be dragged along the bottom of Lake Michigan to retrieve the meteorites.